While comic book purists are generally hard to please, the comic-inspired costume that Paul Rudd wears in the upcoming Ant-Man seems to be controversy-free. However, some notable critics regarding the unitards’s utilitarian value happen to be the people who created the getup. Apparently, a gaping, potentially fatal flaw was left in the design for the sake of aesthetics for the would-be Avengers team member. We had a long discussion about the two cables going into his helmet. They're a massive weakness - Yellowjacket could just rip them off and he's dead. But, in the end, it just looks cooler with them on. Despite this easily-fixable flaw, it’s clear that the wires were viewed as an indelible aspect of the costume. The team of Sheldon and Coveney, who openly made this supposed style-over-substance design choice, have been on board the Peyton Reed-directed Ant-Man project since the days it still called Edgar Wright its skipper. In fact, the Borg-like fashion choice can even be seen going way back to the leaked test footage from the film that made its way across the web back in 2012. (Evidenced in the image above.) However, seeing as this was clearly an intentionally instituted attachment, could there be something more to those tubes? As a result, Ant-Man is essentially running around with things on the sides of his head that are the equivalent of boxes of kryptonite with easily openable handles affixed to Superman’s shoulders. As the film unfolds, we clearly see him matching wits and super-powered brawn with Yellowjacket (Corey Stoll), who, at some point in the film will pilfer the same technology developed by Dr. Hank Pym (Michael Douglas) for his own sinister, likely-greed-influenced purposes. As we’ve seen in the various trailer footage, Yellowjacket’s outfit is remarkably more streamlined and notably free of any graspable "death cables." 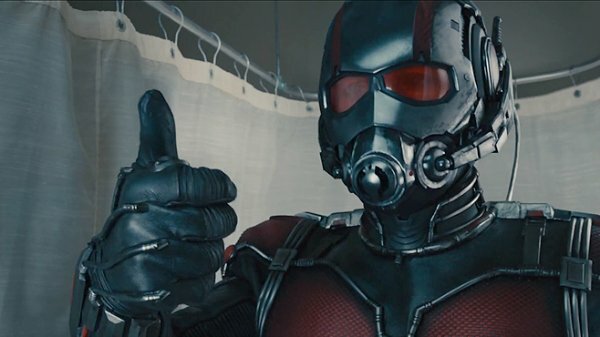 We’ll have to see if the film’s repugnant rogue does, in fact, take advantage of this supposed flaw and if it’s responsible for Pym Particles or just simple, indiscreet on the-the-go testosterone replacement treatments when Ant-Man shrinks its way past movie ushers to hit theaters on July 17.